Throwing pots at the wheel, with a view beyond the edge of the plate. This was Uschi Winsi's personal turning point. 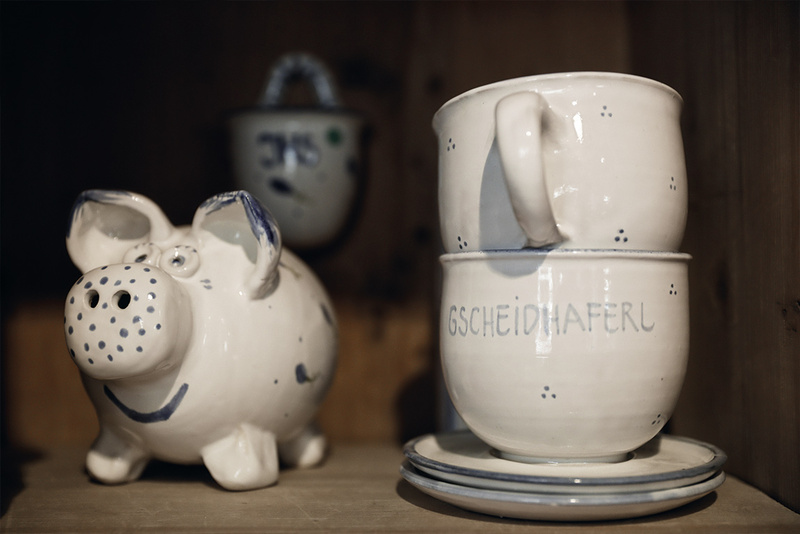 Because the native of Partenkirchen discovered her true love of pottery under a "strict" teacher from Hamburg. She learned that meticulousness could be something great. And could make all the difference to her craft. "With wounded hands but happy nonetheless", she returned to her Bavarian home place. Anyone who visits her shop in the historic Ludwigstrasse is right in the middle of it all: The spinning potter's wheel, the warming kiln and the bending racks with ideas turned to clay. And in the middle of it all, Uschi Winsi. Full of energy, smeared with clay and in full control of the ongoing dual programme. Sales on the one hand, production on the other. Tackling the clay - and the challenge. Because, in addition to creative individual pieces, series production is also essential. For example, cups that are all the same and yet bear the typical Winsi signature. What was created in 30 seconds in Patrick Swazye's legendary pottery scene requires a much longer work process in reality. And, in terms of time, it is like caring for a Tamagotchi. Kneading, modelling, drying, throwing, decorating, firing and glazing. The latter in particular is a science in itself. It took Uschi Winsi a full two years to develop her special turquoise colour tone: "One day I opened the kiln and knew: This was it! It's so much fun." She also enjoys expressing herself artistically. Whether a 10kg elk, a frog that spits water or a money-guzzling piano - individual customer wishes are always a welcome challenge. In doing so, she keeps traditional Bavarian products in sight. Classic shapes are firmly anchored in her range. However, these old Garmisch-Partenkirchen traditions are used in very diverse ways. 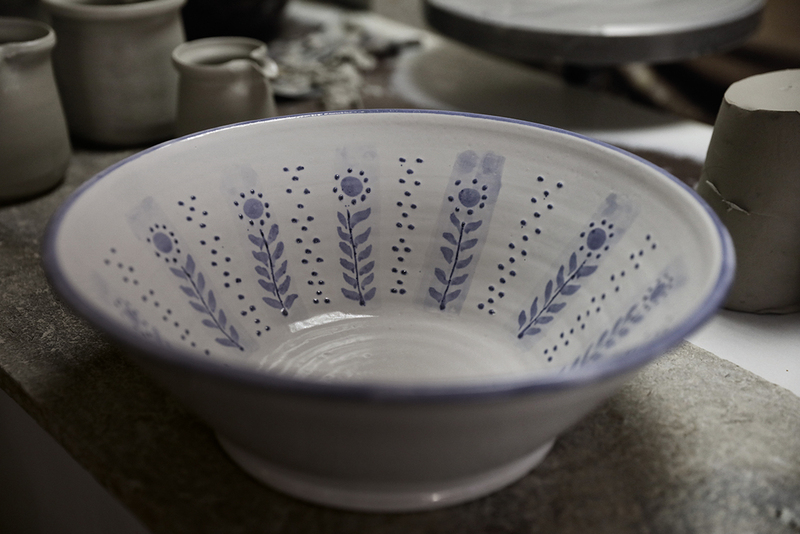 And so the form used in farm ceramics, the 'Weidling', is transformed from a milk curdling container to a fruit or salad bowl. The original salt and pepper bowl, which used to be found on every table in every house, is now used for jewellery or milk teeth. The 'Gscheidhaferl' is guaranteed to get a smile. These large mugs with blue decor and a corresponding inscription have many fans. "I always have to translate them for visitors from the North." Because they have a double meaning: "A gscheids Haferl", meaning that something fits in "gscheid" (cleverly), with the charming double meaning of a 'Gscheidhaferl' - a smart aleck in Bavaria. But whether you speak Bavarian or not, a visit to Töpferei Winsi is always worthwhile. Because there is genuine art in every corner, along with Uschi Winsi's openness. Express your wishes, be inspired and seek them out.